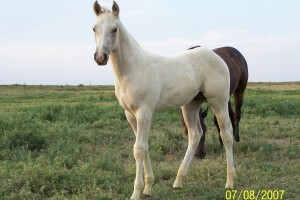 This is one of our colts that was 3 months old when this picture was taken. Bruiser was very ‘Stand Off’, and his mother left her impression on him. I was a good 30 yards from him, and used the zoom on my camera to get this shot. He is telling me, “No Closer, Man”! Once I had the picture, and stood up, he was off in a cloud of dust! His two partners were Pete, and Dunny. When I weaned them at 4 months, I already had them on a creep feeder. I wean by the sign of the Zodiac, and have ever since my Dad taught me that on the ranch. It works! I also castrate all stud colts by the sign. Again, It Works! I ran the three together in a large lot, and would work around them, moving in and out, just minding my own business. However, I always knew where they were, and could feel their eyes on me all of the time. Finally, after about 3 days, Pete was the first one whose curiosity got the best of him, and he came up to me to see what I was doing. I just let him do his thing, and pretended to ignore him. I looked over at Dunny and Bruiser. Bruiser was standing in the corner, and Dunny was watching Pete and I. When I walked off, and away from Pete, he followed right behind. He was already connected. The next day when I went to feed, Dunny, Pete came right up to me, and followed me around like we were good buddies. WE WERE! Bruiser?! He was standing in the far corner, looking at me, and then at Pete and Dunny. His expression was one of ‘Questioning’! Day 3, he came over to the feed bunk, and ate with his two buddies, but he was not relaxed. If I even looked at him, he spun around and was gone. It was like this for a week. I moved all three colts into an adjoining, smaller lot, so that I might have a better chance of bringing Bruiser to me. NOPE! He would come to the feed bunk, eat, and keep a wary eye on me. We performed this little dance around the feed bunk for 2 weeks, and he was not about to give in. Not willingly, anyway! So, I removed Pete and Dunny, who were already halter broke by this time, and put them back in the larger lot. Plus, I could then turn them back out into the pasture during the day. I would bring them in at night, so Bruiser would have his pals in the adjoining lot. Before I would bring Pete and Dunny in though, I would mess with Bruiser, by ourselves! When I say ‘MESS’, I mean ‘Playing Mind Games’! I would walk into his barn, he would run out! I would walk out into the lot with him, walking around, and he would high tail back into his barn. We would repeat this process several times, until I would finally put him in one of the far corners of his lot with just my body positioning. We would stand there, just looking at each other. I wouldn’t give, and neither would he. I would hold him in this position for a while, talking softly to him. Then after a few minutes, I would release the pressure by turning, walking to the gate and leave. I would come back with his grain, and hay. He was fed first, and then I let Pete and Dunny in to eat. We played this little game for 3 or 4 days. He got to where he would go to that far corner, and wait for me to pour out the grain in his bunk, and then take a step or two. When I turned and walked to the gate, he would then come on in to his tub. The final steps in this little dance came when I went into his pen with the bucket of grain one evening. I sat on the edge of his feed bunk, and set the bucket on the ground. Then I waited, and Waited, and Waited, and WAI ted, and WAITed, and WAiTEd, and WAITED, and finally Bruiser licked his lips. He shook his head up and down, licked his lips and took a step, then, another step. Shook his head, licked his lips, and a few more steps. Finally he came right up to me, nuzzled my hat, sniffed around, and let out a big, big sigh! I immediately thought of Manuel Gallegos who told me that when a horse does that, he is letting out all of the evil spirits. I believe that! That was not our final ‘DANCE’, but we were connected. At that time I had not known Dr. Ward, or her program. I was just doing what I do. I know Bruiser’s personality/temperament, and like my wife says, he is anti-social. That’s pretty much right. Bruiser is a Fire/Water personality, and takes a lot of positive reinforcement. Gentle, positive reinforcement. Now we are best of friends, and partners. Oh, yes! 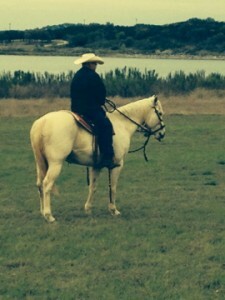 Pete is with my good friend Bruce in Nebraska, and is happy as a ranch horse. He is a top notch ‘Cow-Horse’ also. Dunny is still here with Bruiser and I, along with Scooter and Pecos our black and white donkey. The two amigos are my clinic horses. Scooter is coming along. 2 measuring cups of Steam Rolled Oats with 2 teaspoons of Smart Calm a.m. & p.m.
1 good sized flake of coastal hay and 1 flake of alfalfa 2=3=times per day. 2. He has been dewormed and is current on his vaccinations. 3. Bruiser is a Fire/ Water personality and it takes him a long time to trust other people. He requires a lot of POSITIVE REINFORCEMENT! If you teach him how to do something right he will pick it up. If he does not catch on at first, do not thump on him. Keep showing him what you want him to do, and when he does it correctly, praise him vocally and with a pet on his neck. Treat him with kid gloves but be firm. If you follow these instructions he will work for you, but give him time to think it through or else he will blow up and leave you hurting in the dirt. He has never offered to buck with me, but he has jumped out from under me and dislocated both shoulders. Larry is a certified Horse Temperament Typologist and available for consults. (Temperament Typing Consult offered at special discount for month of September, 2014 so sign up today!). This entry was posted in Five Element Personality Typing, Five Element Training, General Horse Care and tagged fire horse, holistic horse care, horse, horse temperament, horses on September 28, 2014 by Madalyn Ward, DVM.